US 59 was commissioned in 1934 to run from the Canada border to Port Arthur. 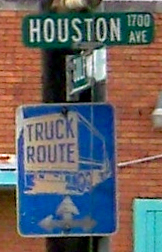 The US 69 designation arrived the next year, south from Kansas City. Then in 1939, US 59 was rerouted to go south and west from Tenaha (as it does today), so US 96 was commissioned to replace the old segment of US 59 between Tenaha and Port Arthur. That same year, the US 287 designation was extended into Texas. 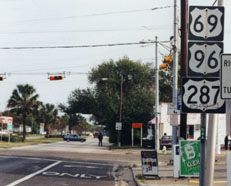 It meets US 69 at Woodville, and overlaps with it to Port Arthur. 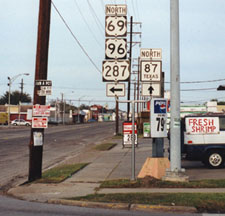 So, although US 59 was the first of the federal routes to serve Port Arthur, it is also the only US designation that was ever removed from there. Initially, highway traffic between Beaumont and Pt. Arthur used the road that is today designated as TX hwy. 347 (Twin City Highway). In the Griffing Park neighborhood, the route did a couple jogs and traffic ended up heading south on 9th Avenue, reaching TX hwy. 87 at 16th Street (now known as Gulfway Drive). This route was probably used by US 59 and US 69, but that did not last long: today's road (Woodworth Boulevard/Memorial Boulevard) was built between 1935 and 1938. So US 96 and US 287 probably never used the old route. Those were heading southeast on Woodworth. 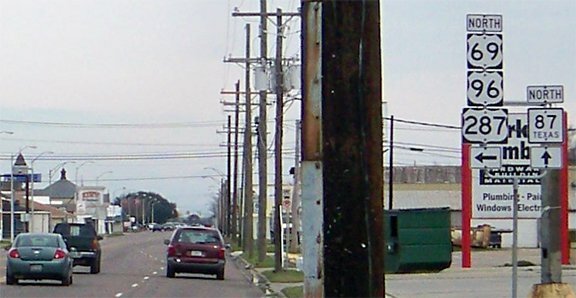 An "End" tab would be a welcome addition to that signpost, although that particular location would also be an appropriate place for a "JCT TX 87" sign, because the traffic signal just beyond is where the US routes end at Gulfway. ​The current beginning of US 69-96-287 is to the left on Woodworth. 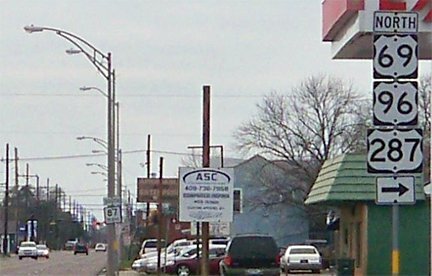 To the right on Woodworth was the north beginning of the business loop.